Scuba diving is a sport. No doubt about it. To anyone who wants to argue, do an hour-long dive and tell me how you feel just half an hour later. Chances are you’ll be famished and ready for a nap. The reason we’re not all beacons of fitness is that we don’t do it every day. 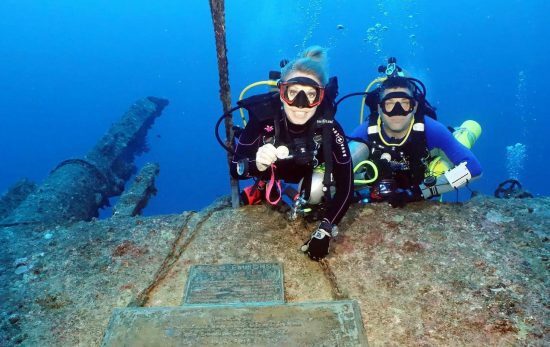 Unlike a runner who gets to put on shoes and run whenever the urge strikes, diving requires a little more time and planning, nevermind access to a good dive spot. Still, there are some things that make it easier: the ability to stay calm under pressure, and relative physical fitness. Enter the divemaster equipment exchange. The equipment exchange portion of divemaster training is the test that measures your ability to stay calm underwater, to solve problems underwater, and just generally to keep your stuff together. Equipment exchange is one of the skill tests that I have heard a lot of people struggle with. This is because it task-loads a diver and requires they figure out their problems underwater. The exchange includes switching fins, mask, snorkel and BCD with your buddy, all while buddy breathing off of one regulator. When I did my test, I got lucky. Not only did I have no idea that I was doing it, but I got to watch a buddy pair go before me. 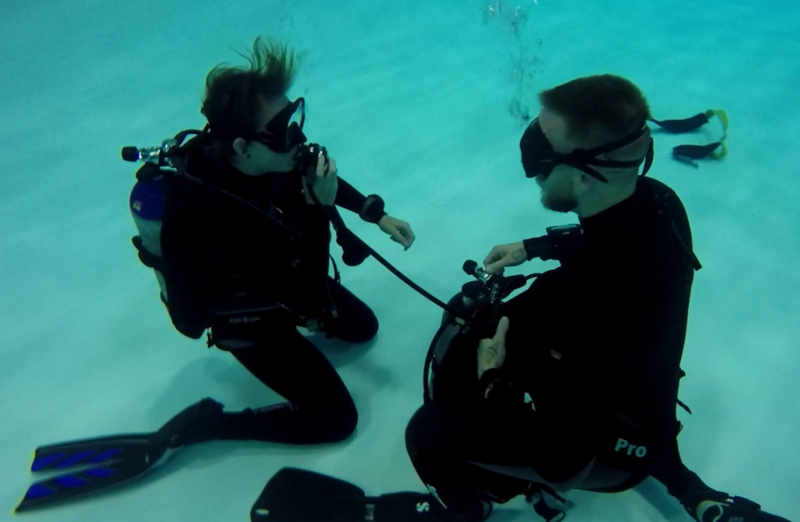 The first thing our instructor told us was that we were going to practice buddy breathing on the surface. We were told to share one regulator between ourselves, and each take a couple of breaths from it. Simple, right? Next we were to do it underwater. By now we had all guessed where this was heading–the equipment exchange–and we waited to have it demonstrated for us, just as the divemaster skills had been demonstrated. Instead, our instructor told us that we would be doing the equipment exchange. He said we’d have a couple of minutes to discuss with our buddy on the surface before we were to descend and perform it. He said that there was no time limit and that the only goal was to successfully exchange equipment. I hopped out the pool and grabbed a weight belt knowing that as soon as I took my BC off I’d be floating to the surface. Once back in I watched the pair who would be going first discuss their plan. They talked about whose BCD they’d be using to buddy breathe from; how they’d remove equipment; and who’d be breathing from the regulator during equipment removal. They also talked about switching the mask over, which I hadn’t even thought of, and which, to my mind, was the hard part. To be perfectly honest I couldn’t process their plan. It all sounded so convoluted and complex. And, as it was their first time, it would probably not work out as planned. Still, I silently chided myself for being slow on the uptake. Before everyone descended I announced that I wouldn’t be discussing the exchange before performing it, that I’d need to just do it to figure it out. Trial and error, my modus operandi. All I knew was that I had the ability to keep calm underwater; to do things slowly; and that like anything else, divemaster is about practice. If I screwed up the first time, I would have another chance to do it again. 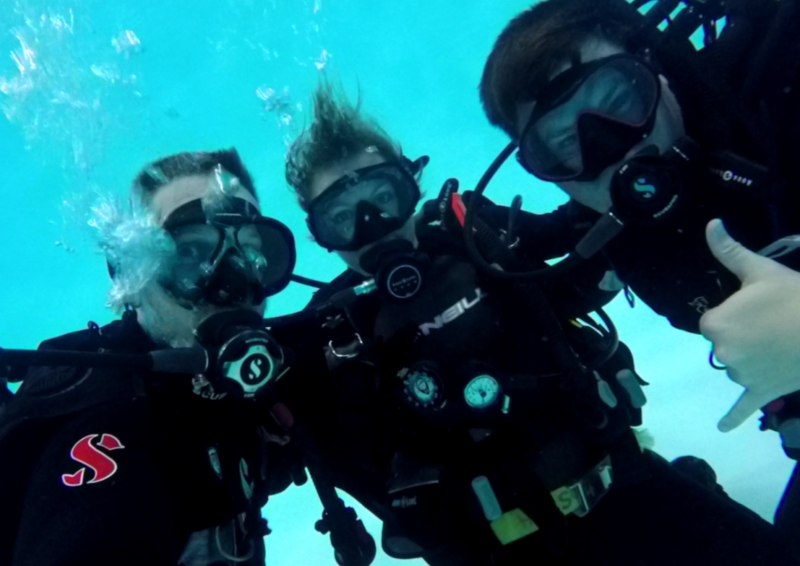 Only vaguely comforted, I descended with my instructor and my fellow Divemaster candidates who would be performing the exchange. As predicted, it rapidly went to pieces. They did the exchange too quickly and as a result got out of breath. Even out of breath they didn’t stop themselves to calm down. Things got messy. Fins floated up, buoyancy was lost, and there wasn’t much communication. When it came time to remove their BCDs, one of the pair got tangled up and was so out of breath that he darted for the surface. 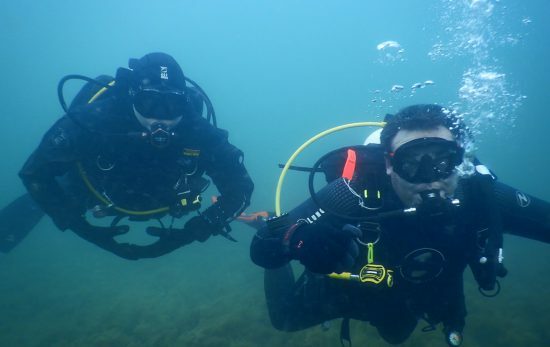 Now in scuba diving, we all know that the place to solve problems is not on the surface. It’s wherever you are. Bolting for the surface is the best way to give yourself a lung expansion injury and yes, even in 12 feet of water. Not something any of us want. When the divemaster candidate bolted, our instructor moved rapidly. He shoved his spare regulator in his mouth and stopped him. I immediately saw why we had not been told to practice the exchange on our own. There was still an element of risk involved. We all ascended and the buddy pair had an opportunity to debrief. They tried one more time, this time getting further along but still not finishing due to similar problems; going too fast, and losing buoyancy control due to breath holding. In case you’ve forgotten, the most important rule in scuba diving is never hold your breath. Thus, when we’re doing equipment exchange, even though we’re on a flat bottom, you still have to obey the rule. Hold your breath and you’ll buoy up like a balloon. Because there were only three of us divemaster candidates in the pool that night, my friend Ben had to do it again with me. I repeated what I had said earlier that night to him, that I just needed to figure it out once we were down. Ben seems to work in much the same way as I do, throwing himself into whatever interests him, and solving things from a creative rather than purely logic-based approach. Ben and I began buddy breathing. We did it for a while to get used to one another’s rhythm, making sure we were making the “z” sound to let out a tiny stream of bubbles. Then, we began exchanging equipment. It went really smoothly until we got to the mask. The second we hit that point, I couldn’t even fathom what to do. After a couple of incomprehensible hand signals at one another I took a leap of faith. I took off my mask and handed it to Ben, trusting he’d know what to do. 10 seconds later I received an unfamiliar mask in my own hand. I put it on, and just as I was clearing it with the remaining air in my lungs, the regulator was handed to me. Excellent timing. Our instructor swooped in and gave us high fives, then signaled us to ascend. We broke the surface laughing and giddy. Because Ben had done it three times now, I got to repeat the exchange with the other DMC. This time, I knew what to do. As soon as things began to speed up, I stopped exchanging equipment with him, and had him focus on just breathing with me. We got back to a nice, slow pace. When he lost his buoyancy, I grabbed his BC and held him down and we went back to the breathing again. When we switched BCs I had to help him get mine on as it was too small. At last we were at the mask exchange stage. Once again, I whipped mine off. This time, when I was handed the mask, I waited to clear it. No sense in getting rid of all my remaining air prematurely. The regulator followed shortly thereafter. And, hey presto, we were done! 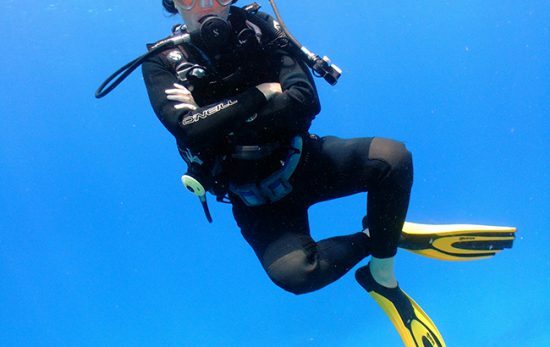 When we surfaced, our instructor sat back on his own BC, a huge grin plastered on his face. None of us even knew we’d been taking the test. We just figured we’d been practicing. We all whooped. Although the last two exchanges had gone well, we had all learned or re-learned a lot. I’d been reminded of the importance of doing things slowly, and of breathing deeply, and I’d had it demonstrated first-hand, how quickly things can spiral out of control when you don’t. I also learned the importance of having a buddy you can trust. The fact of diving is that at some point, something will go wrong. Ideally, however, you will be diving with someone who has the ability to keep calm and problem-solve underwater. Just as my buddies figured out what to do with the mask, I had to trust them to do it. No doubt, if you ask around, you’ll receive plenty of advice on how to get through the equipment exchange. I know I did. Most of it went over my head. So, I won’t bog you down with too much advice. I’ll just share a few tidbits that you’ve likely picked up anyway reading this article and that will hopefully be second-nature to you anyway if you’re serious about diving. Don’t overthink it. This is probably obvious if you read the whole article, but it’s true. The idea behind the skill is to test your ability to solve problems underwater and stay calm. So, why not do that? Use it as an opportunity to do just that. It is after all just practice. Focus on breathing slowly. For that matter, focus on doing everything slowly. None of it is timed, which means you can take as long as you want. Trust me, things get a lot harder when you start breathing fast. Double check if you need to wear a weight belt. 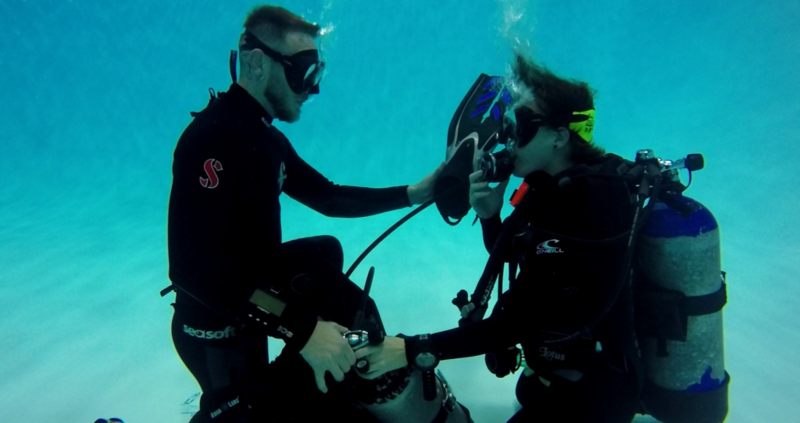 If you don’t, even if you do manage to get your buddy’s BCD on quickly, if your buddy doesn’t have integrated weights and you do, then you might end up with some buoyancy trouble. Keep it simple. And that’s it. That’s all my advice. Keep your own equipment on. Don’t exchange it before you start. Don’t practice before hand. Do it when you know you can perform the exchange safely with someone experienced watching. And most of all, don’t over analyze. This is a learning opportunity, and a whole bag of fun! 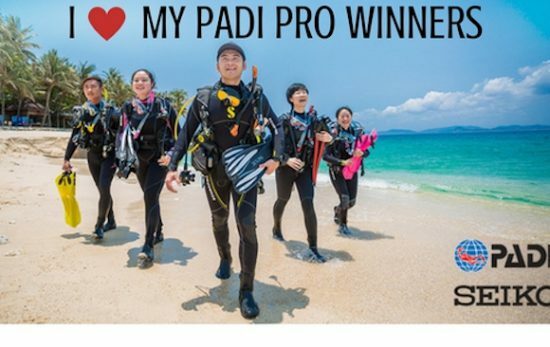 Interested in becoming a PADI Divemaster? Learn more here.